When I have a question, I ask the bears. 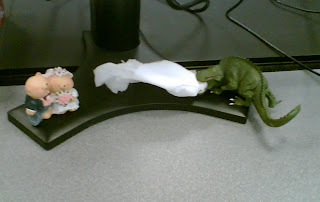 I have arranged this charming set of figurines in my office cubicle (ok, it's not a cubicle, it's "the floor"). The scene is an allegory on War and Peace. Anyway, when I have a question, I ask them. Often, by the time I've described the problem, it has vanished. Otherwise, I ask my excellent colleague Philip. Next weekend I am in Korea. When I have a question, I ask the bears. was published on June 12, 2007 .